Use the following as a guide in preparation of the program for your NRA Sanctioned Tournament. All items shown should be mentioned in your program. 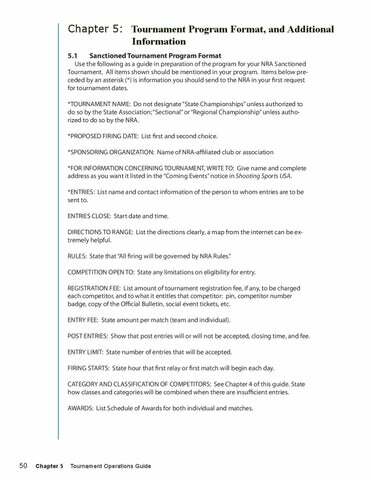 Items below preceded by an asterisk (*) is information you should send to the NRA in your first request for tournament dates. *TOURNAMENT NAME: Do not designate “State Championships” unless authorized to do so by the State Association; “Sectional” or “Regional Championship” unless authorized to do so by the NRA. *PROPOSED FIRING DATE: List first and second choice. 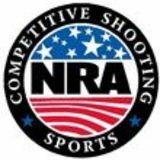 *SPONSORING ORGANIZATION: Name of NRA-affiliated club or association *FOR INFORMATION CONCERNING TOURNAMENT, WRITE TO: Give name and complete address as you want it listed in the “Coming Events” notice in Shooting Sports USA. *ENTRIES: List name and contact information of the person to whom entries are to be sent to. ENTRIES CLOSE: Start date and time. DIRECTIONS TO RANGE: List the directions clearly, a map from the internet can be extremely helpful. RULES: State that “All firing will be governed by NRA Rules.” COMPETITION OPEN TO: State any limitations on eligibility for entry. REGISTRATION FEE: List amount of tournament registration fee, if any, to be charged each competitor, and to what it entitles that competitor: pin, competitor number badge, copy of the Official Bulletin, social event tickets, etc. ENTRY FEE: State amount per match (team and individual). POST ENTRIES: Show that post entries will or will not be accepted, closing time, and fee. ENTRY LIMIT: State number of entries that will be accepted. FIRING STARTS: State hour that first relay or first match will begin each day. CATEGORY AND CLASSIFICATION OF COMPETITORS: See Chapter 4 of this guide. State how classes and categories will be combined when there are insufficient entries. AWARDS: List Schedule of Awards for both individual and matches.